I’ve got another fun Easter basket idea for kids! 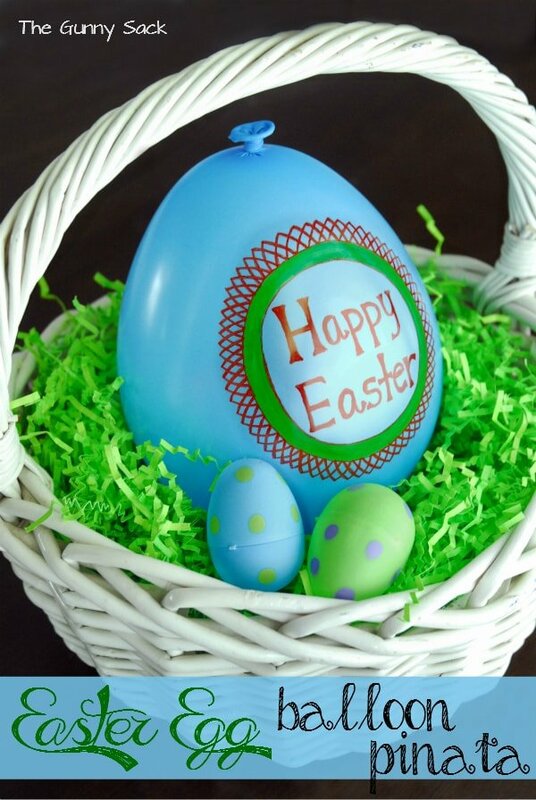 Make Easter egg balloon pinata to add to the baskets. Well, they aren’t true pinatas but since they are something you break open to find treats inside that is what I decided to call them. Start with a balloon, fill it with goodies, blow it up and pop it to get the treats! Last year for valentines day, I made balloon Valentines and I have given the busting balloons to kids for their birthdays many times since then. This past weekend my whole family got together to celebrate all of the February and March birthdays and I made 5 of the balloons! Each balloon had wrapped candy and dollar bills that were rolled up before inserting them. We wrote each kid’s name on a balloon and gave them a colorful toothpick to pop them with. They loved it. So i thought why not make a bursting Easter egg balloon? What kid doesn’t like popping balloons and when there is a surprise inside, all the better. It’s just another fun Easter basket idea. Start with some large balloons. I’ve purchased balloons many times and for some reason this was the first time I noticed that there was more than one size available! I chose the metallic spring colors. I also bought a bottle of Life Water because of the wide mouth of the bottle. Vanessa promptly drank it for me and I cut off the top to use as a funnel. I also purchased longer narrow candy that I thought would be able to fit through the hole in the funnel. I chose Easter Twizzlers, Easter Kit Kats, Smarties and Hershey Kisses. 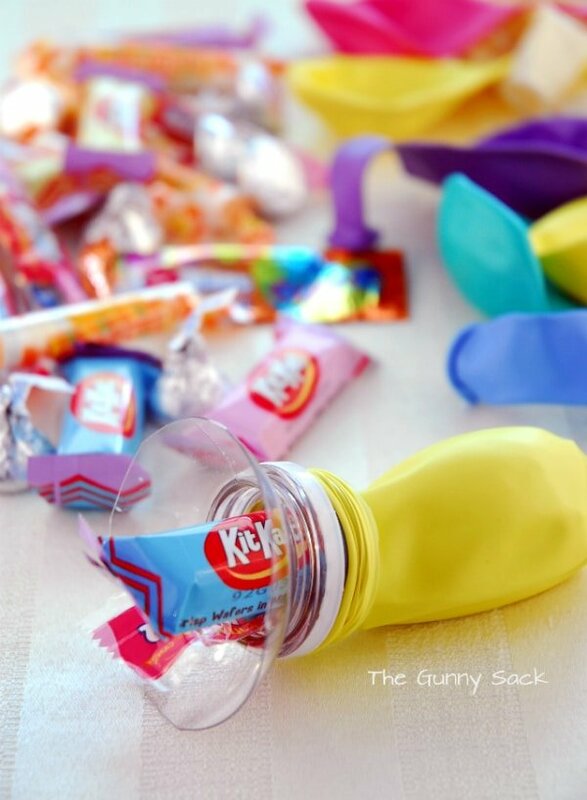 Take a balloon, roll up the neck a bit and carefully stretch it over the mouth of the funnel. Then, carefully start inserting the candy, treats and money, stretching the balloon as you go. It would also be fun to put confetti in the balloons but that would make a mess so be prepared if you decide to add it! Gently slide the neck of the balloon off of the bottle mouth. When I was making the birthday balloons, I wanted to fit a lot of stuff in them. So, after stuffing as much as I could into the balloons and taking them off the bottle, I blew up the balloon so that the candy fell to the bottom. Then, I let the air out and stretched open with balloon neck with my fingers while Vanessa put in a little more candy before blowing it up again and tying it shut. I filled a total of 8 balloons over the last couple of days and only one got a hole in it while it was being filled. The balloons were already an egg shape but I wanted them to look more like Easter Eggs. So I used Sharpies to write on the balloons. Instead of going traditional Easter egg style, I wrote Happy Easter and added decorative circles on the balloons. The best part is popping the balloons! Using a brightly colored toothpick pop the balloons and enjoy the treats inside. Always remember to discard the balloon once it has been popped. 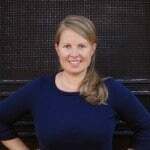 It could be a danger to young children and to pets! 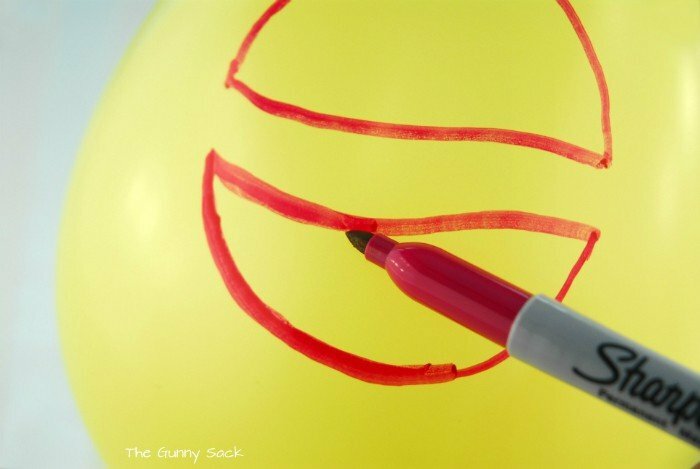 Want some more balloon ideas bursting with fun? I am having my twins birthday on Sunday, could i fill and blow up balloons ahead of time? if so, how many days? Yes, you can blow them up ahead of time, but the balloons will deflate somewhat if you blow them up too soon. I’m not sure how quickly though. Happy Birthday to your twins and best of luck with the party! Oh wow! GENIUS idea! I’m totally going to do this for my kids’ birthdays instead of pinatas from now on! I hate the scramble for candy/goodies when the pinata breaks. I’d rather deal with the balloons popping (which I also dislike, but hey, maybe I can send them home as part of the goodie bags … let the parents deal with the popping …). Could you use helium to blow up candy filled balloons? I’ve never tried it but would love to hear if it works for you! They would be too heavy.